Rather than merely providing a 'come-on' to bees and other insects to attract them to pollinate the flower, nectar could be playing a much more subtle and entrancing role. Scott Armbruster, Professor of Ecology and Evolution at the University of Portsmouth, and one of the authors, said: "Contrary to the accepted wisdom, the role of nectar seems in this instance to not be just about attracting and rewarding pollinating insects. "It seems nectar and nectaries, the glands which produce it, attract herbivores that would otherwise feed on other flower parts. Thus the nectar and nectaries may be acting as a decoy. 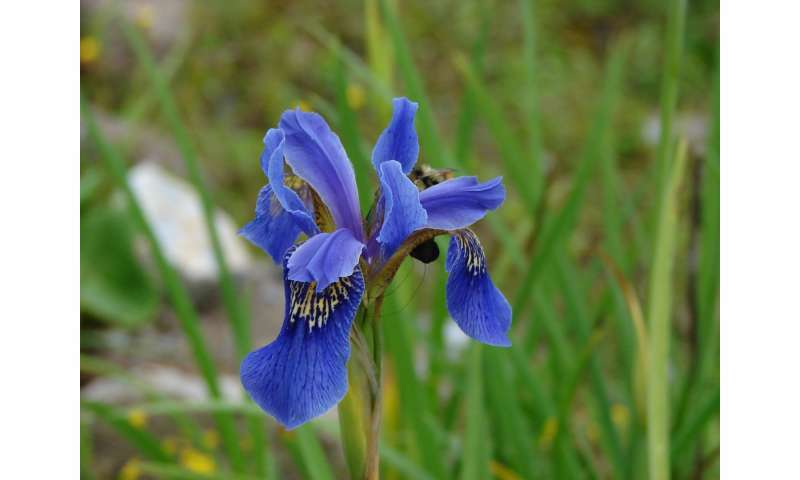 Like nectar thieves and robbers, the herbivores we observed have a high energy demand, and because nectar is rich in nutrients, it appears flowers are using it as a distraction, to keep herbivores away from critical reproducing parts of the flower, which are also edible. "They are sacrificing their nectar and nectaries for the greater goal of maintaining other floral parts that are critical for attacting pollinators, and hence being pollinated." Nearly all (98 per cent) of the flowers studied in natural conditions were damaged by herbivores, but in 85 per cent of the flowers, damage was restricted to just the nectaries, suggesting nectar was being sacrificed to protect more critical parts of the plant. The researchers saw sawflies 'frequently' using the flower as a mating site during which all the nectar and nectaries were eaten, mainly by female sawflies, causing no damage to the stamen and stigma, the reproductively critical parts of the flower. Even though colourful - and edible - petals play no direct role in producing seeds or pollen, they do attract the interest and attention of pollinating insects, such as bees. When sawfly herbivores grazed on the petals, damaging them, fewer pollinators visited the flower, meaning its chances of reproduction plummeted. By offering up a decoy of calorie-rich nectar, the herbivores were distracted enough to not damage the petals or other parts of the flower critical to its chances of being pollinated. Professor Armbruster said: "The results are clear that floral tissues with a higher reproductive importance are essentially protected through the presence of sacrificial parts, the nectaries and nectar."